Anyway I deal with the world; no amount of global sophistication will take the farm out of the boy. I was raised in a small town with 400 people in an area surrounded by farms. Although my parents did not own a farm, I spent from age 12-20 working summer on a farm for a man I truly respect and miss by the name of Buster. He was a truly noble person on the planet. I was a lucky boy, I was a farm boy. If you for some strange reason have seen all my photos for years, you would notice I have taken many pictures of Tractors. Therefore getting an email below in my email box gave me a warm feeling. I believe this is the photo that elicited the email below; I am not sure, however, after the photo a person started writing me and wanting to know more information about this Tractor. 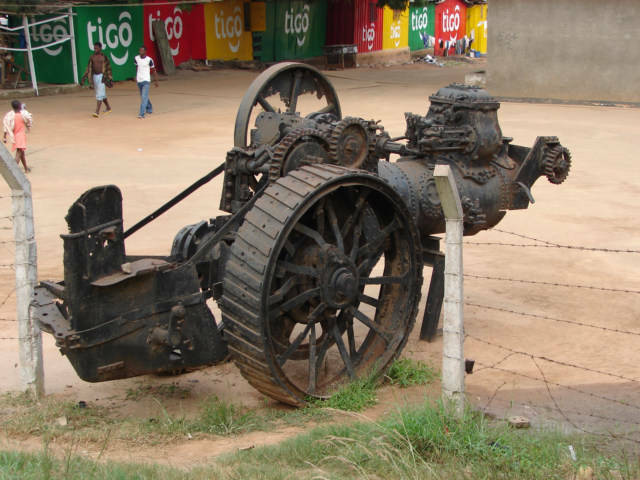 Unfortunately, I was just walking by this Tractor in Accra, Ghana and did not stop and ask questions. I will go back one day and find the answers to his questions. I would like to introduce our new site YouTractor.com. Described on some sites as Youtube.com for tractors, this video site is dedicated to tractors of all sorts. There are videos of tractors ploughing, cutting turf, silage and hay. There are vintage tractors and even the most powerful tractor in the world. I will go look for a John Deere 4020, that is my tractor and alway will be.